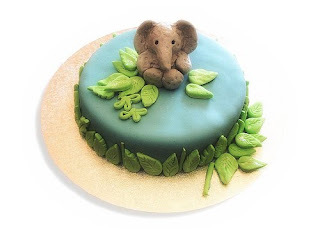 Here is Bargy's 4th birthday cake depicting (as requested) his cuddly elephant, Ellie (below). I fashioned the sugary Ellie using Wilton's Ready-To-Use Gumpaste. Its quite pricey in Australia, but is easy to work with and sets very well. 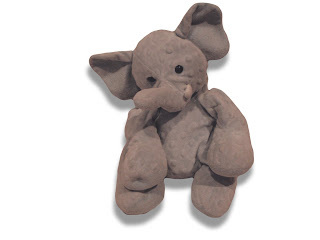 The hardest part was trying to reproduce Ellie's sad mottled grey-blue, saggy appearance. (Her replica is possibly just a hair's-breadth away from being Cake Wrecks-worthy). I'm thinking of it for all our critters! Oh Liesl you've outdone yourself. it's the most magnificent elephant cake I've ever seen. You is a good mummy - I'm sure he thought you were the bestest mummy EVAH! Like I said - you keep outdoing yourself. Genius at work. Wow. I'll bet the little man was chuffed! That is fabulous!! And while I can imagine it on Cake Wrecks, only for Sunday Sweets (where they have all the pretty cakes). It is gorgeous!! It looks professionally done in the best possible way. Lovely, lovely cake and elephant, Leisl. How lucky are we to have the skills and confidence to do the cakes that our little ones order! And what sweet imaginations they have. I'm sure it'll be a lovely memory in the album. Well done. Aww, too cute, well done! I thought you had put a stuffed elephant on the cake.....so realistic!!!!! So not a Cake Wreck! This is just stunning, Liesl...I'm assiduously not showing any of my kiddos lest they get any ideas, heaven forfend! oh just fabulous. Well done! I think its an amazingly good likeness. What a stunning cake! It would only ever feature on Cake Wrecks' Sunday Sweets series. Holy crap, that's amazing. The colors are fabulous as is the elephant and all the leaves. Thank you for sharing with us. Your cake looks totally fabulous Liesl, I love the little Ellie and I bet Bargy did too. You are awesomeness itself. Can you please make me a cake for my next birthday???? Remind me too to show you pictures of my 21st birthday cake one day. It was covered in native flowers. I think you'll like it. ah you're a cake genius! i hope he adored it! Too good to eat, this is amazing. Super effort. fantastic cake well done!!!! I am sure mister 4 years was a very happy little boy.. I am very impressed! The cake looks incredible. Great replica of Ellie- I bet the small boy was impressed! Wow, that is fantastic! You're a woman of many talents Liesl.